In the modern woodshop, the table saw is king. A table saw can rip, crosscut, bevel and miter. It can create coves, tapers, even cut circles with the right jigs and fixtures. Table saws allow more accurate, precise and repeatable cuts in a multitude of materials. Even more complex joinery, such as tenons and finger joints, can be created on the table saw. Which table saw should I buy? Why buy used? Why shouldn’t I buy used? How do I pick out a great table saw? How do I avoid bad table saws? Glad you asked. In today’s Tool Primer, we will walk through the various types of table saws and discuss the different features. Then, I’ll break down which features I find most useful in the shop. Lastly, I will discuss the used table saw market. Lastly, I will make a recommendation of which saw to buy. Tables saws come in essentially three classes. Each class has its own strengths and weaknesses, features and issues. Figuring out which type of table saw you need great simplifies which table saw to buy. Benchtop and jobsite saws can fit on a bench top. They can be moved by one person. Larger versions of these saws can be purchased with a stand, while smaller versions are built to be mounted on a bench. Your local home center often deals exclusively in this type of saw. Due to the many drawbacks, I counsel against buying a benchtop table saw. Almost all table saw operations can be accomplished with simply a circular saw and guide in a safe manner for cheaper than a new jobsite saw. Used jobsite saws often have missing and ineffective safety guards. If you absolutely must get a benchtop model, buy a reputable brand. Good benchtop models cost between $300 and $600 brand new, and about $150 to $300 used. Look for one with 3/4” thick miter slots, sturdy blade guards and a fence that locks square and tight. Or, you can save just a bit more bread and upgrade to something you will enjoy the first time. Hybrid or contractor saws feature more mass, more power, standardized miter slots, and higher quality rip fences and miter gauges. When introduced, contractor saws featured an “out-board” motor which gave some measurement of portability. Hybrid saws enclosed the motor, while cutting back on the weight. Most of these saws also run on 120v power, which means you don’t need to add fancy circuits to your workspace. These saws are often the highest quality a hobbyist really needs. New saws range from $600 to $1500 dollars and often go for half value in the used market. I have used nearly all the major brands and find them all great machines. The dream saws. Big, meaty, powerful beasts that can take three grown humans to move, a full workday to set up and a 220v electrical hook up. They perform safer because of the build quality. A good one will last a lifetime (or two, if you find an apprentice). The only drawback is cost and portability. The high cost for the saw and electrical hook-up is hard to justify on a hobbyist budget, while the portability means if you have to move, you will have to hire movers. Prices for cabinet saws range from $2000 to $5000 new. 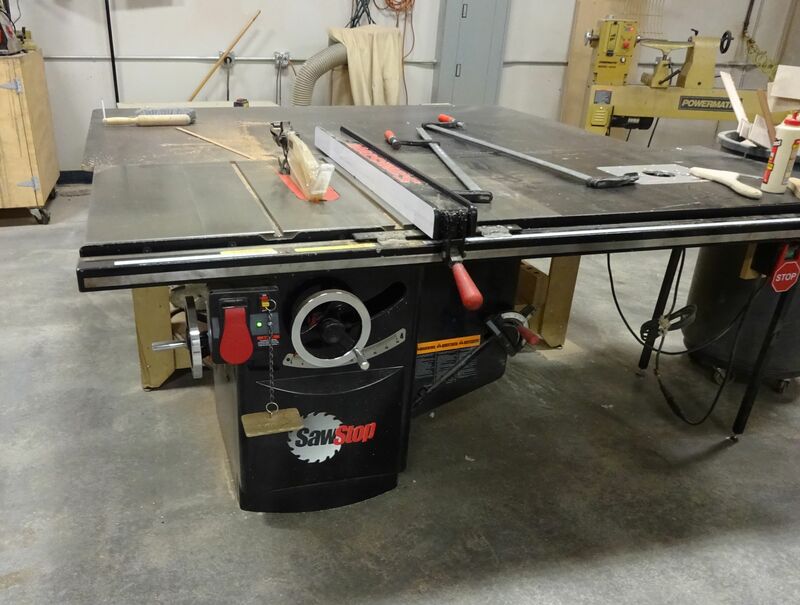 Used cabinet saws often go for around $1000 on the used market. Again, brand matters less than comfort and availability. All major brands’ cabinet saws work well. Turn off the saw at the switch and unplug it. Lock down the fence a few inches from the blade. Raise the blade to its highest point. If the two measurements are the same, the fence is square to the blade. Square fences decrease the chance of kickback. Look for a square rip fence which locks tight. Most fences are adjustable, but poor fences won’t keep their settings. T-Fences, such as those popularized by Biesemeyer, work great. While there are lots of aftermarket fences on the market, I don’t believe in lipsticks on pigs. Get a saw with a great fence. The miter gauge should fit in a standard slot, which makes it interchangeable with the rest of the shop. A great miter gauge allows a sacrificial fence to be attached to it. Look for a beefy, metal miter gauge. The splitter is a piece of sheet metal which sits behind the blade. This splitter keeps the work piece from pinching the blade and causing a kickback. Cheap ones are attached from behind the saw, while better designed splitters are attached underneath table surface. Some splitters, called riving knives, actually rise and fall with the height of the blade. Riving knives can be found on most new table saw blades. The blade guard is often a clear plastic shroud which covers the blade. It won’t save your finger, but it does let you know when you are approaching the danger zone. Anti-kickback pawls are small, metal spring-loaded wings attached to the splitter. The pawls allow you to feed your work through the blade in the proper direction. If you try to pull your work out, such as what happens during kickback, the pawls stick in the wood and halt the wood’s movement. All new saws come with all appropriate safety features. The safety features should be easy to install and remove. Use the appropriate safety devices for every cut. Used saws may or may not come with safety device. Do not buy or use a saw with a missing safety device. Using the table saw exposes the user to a significant risk of amputation or laceration to their hands and fingers. Flesh-detection technology, pioneered by SawStop, reduces the risk of amputation and laceration. A SawStop has integrated electronics which can detect when flesh (or other conductive material) comes into contact with the blade. If this occurs, the machine stops the blade and drops it below the table. The user saves a finger or hand. This technology works. It saves fingers. End of story. Better yet, SawStop has a benchtop/jobsite, contractor and cabinet saw version. I’ve Decided to Buy New! If you are deciding to buy a new saw, I heartily recommend the SawStop, in any configuration. While it is far more expensive than a used Craftsmen, the SawStop is a great saw for a new user because it will keep the user safe from laceration and amputation. SawStop’s customer service is second to none, they are an American company (if you are into that) out of Oregon and most importantly, the saws are fantastic. I’ve Decided to Buy Used! The saw blades raises and lowers. The table isn’t pitted or twisted. The fence system works smoothly, locks down square. The saw is as big as your budget (or use) can handle. Great hybrid and cabinet saws can be had for at or less than $1000 in any major metropolitan market. They will often resell at a similar price. High-quality benchtop/jobsite saws can be had for $200 or so. Older Craftsman saws constantly churn up and really aren’t worth the money. Now go make some sawdust! Thank you for visiting my blog. To support for this site, please like WoodshopCowboy on Facebook or follow me on Instructables. Twitter, Pinterest or Instagram.